台北信義區新開幕的“五之神製作所” (東京新宿 つけ麵 五ノ神製作所) 為東京新宿人氣沾麵的海外分店, 餐廳位置低調, 位於市政府捷運站的松山菸廠附近. 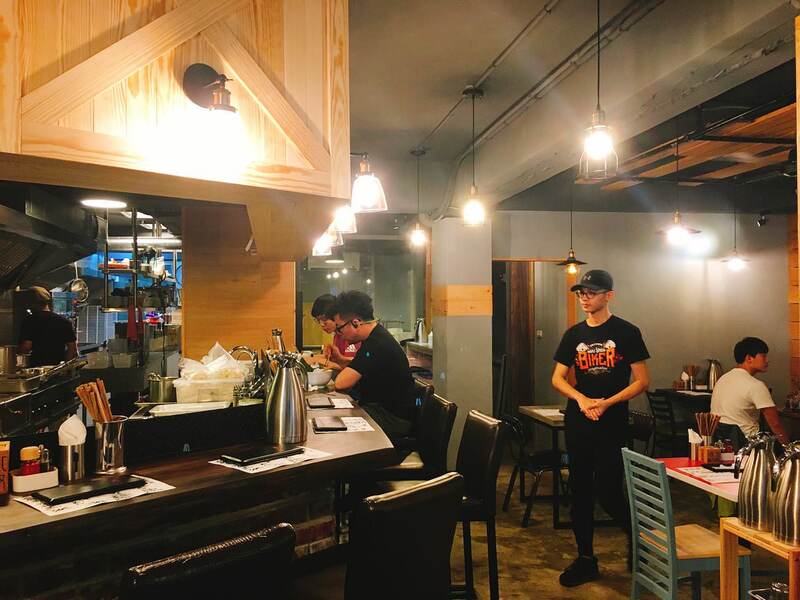 GONOKAMI RAMEN restaurant had its grand-opening on 2017 at Taipei Xinyi District near Songshan Culture Park. 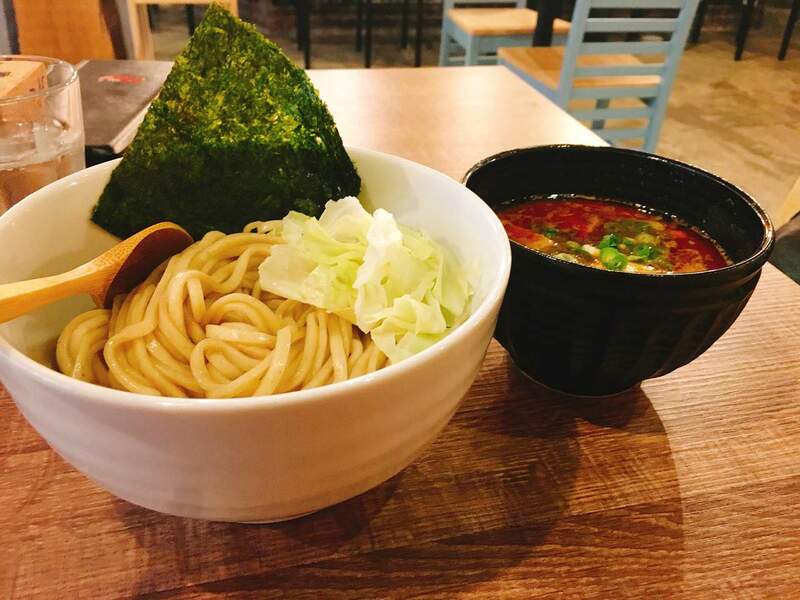 It is the first oversea branch from Tokyo Gonokami Ramen headquarter. 由於是海老系列, 難免會跟同在台北信義區的一幻拉麵比較, 因為我在一幻是點湯麵, 在“五之神製作所”是點沾麵, 並無法做完整的比較. 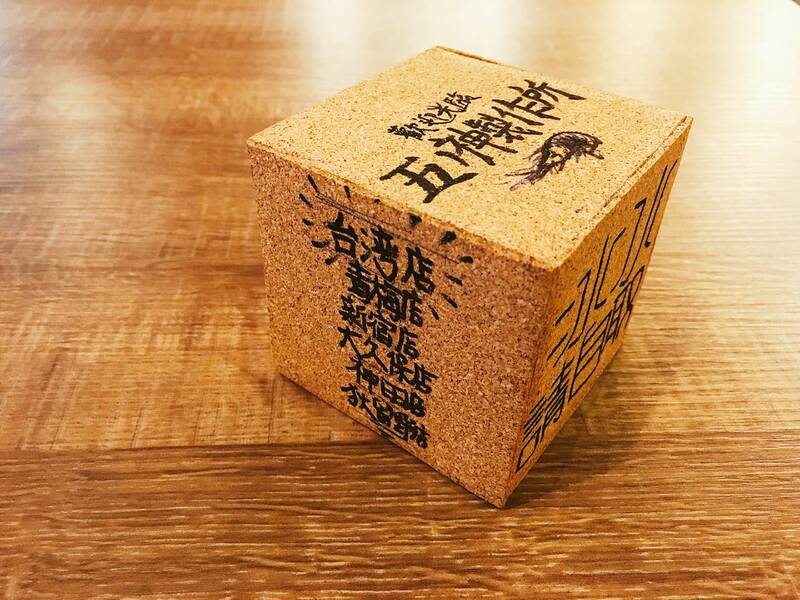 走進餐廳, 有吧台高腳椅, 也有2人~4人的座位, 座位間隔相當寬敞, 也蠻適合小家庭用餐環境. 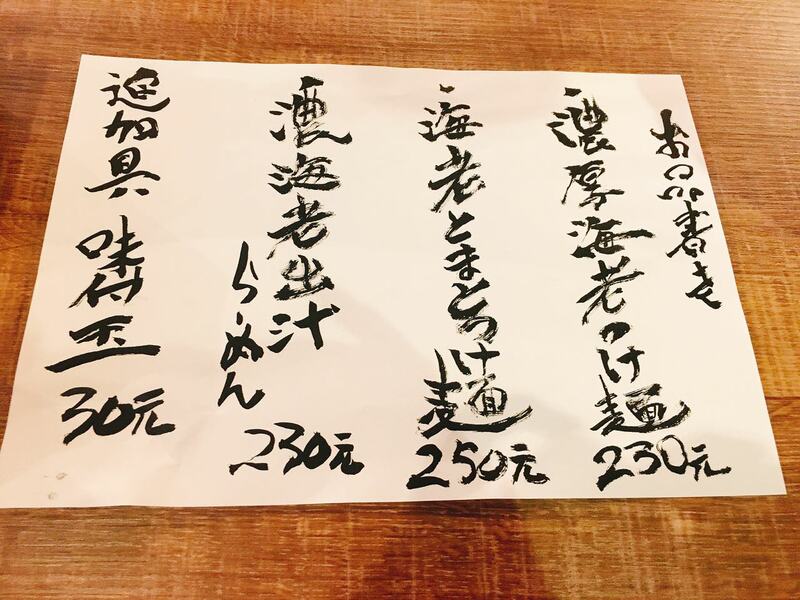 Because it is also shrimp based series, it will be compared with EBISOBA ICHIGEN RAMEN at Taipei Xinyi District. But since I ordered Tsukemen, which means noodle with dip sauce, it is impossible to compare those two restaurants. Entering the restaurant, there are a few high chairs and also seats for party of 2 ~ 4. There are plenty spaces between tables. 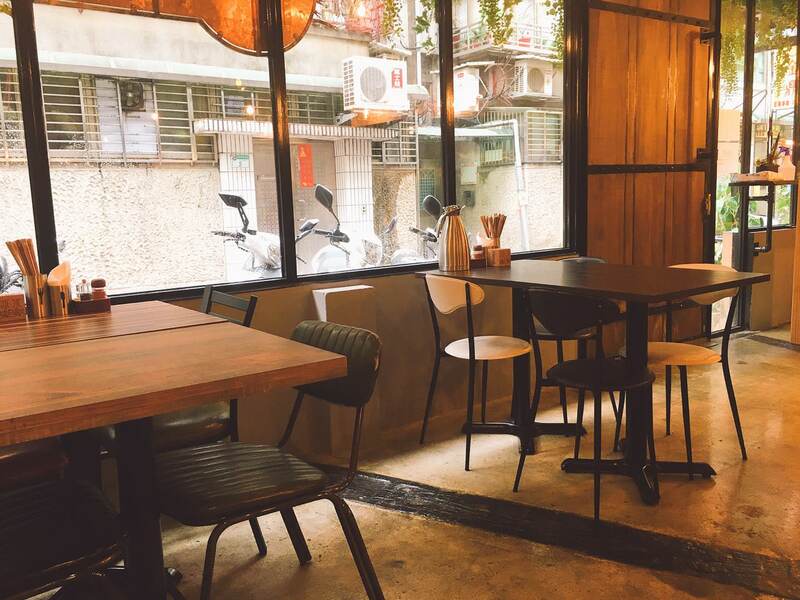 It is great for small family gathering, which is quite rare in Taipei Ramen restaurants. 端上桌時, 服務生告知可先品嚐無沾醬的麵條, 粗直條麵條有著特殊的麵條香氣, 麵條雖然偏軟但非常有嚼勁, 讓人忍不住多品嚐幾口. 沾醬如同其名稱- 濃厚, 大量的蝦頭精華給予沾醬滿滿的鮮甜風味, 豚骨與雞骨的膠質讓沾醬稠度增加, 服務生在上菜時也提到吃到最後, 沾醬可再加高湯稀釋就可以像湯一樣喝. 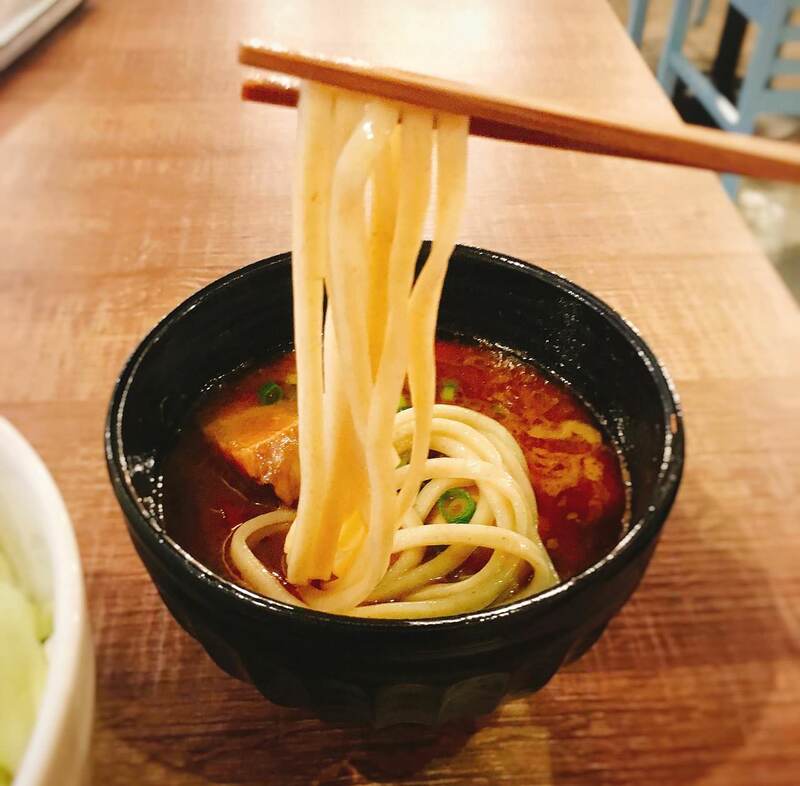 The waiter is kind enough to inform that it would be better to taste the noodle original flavor without any sauce at the beginning. 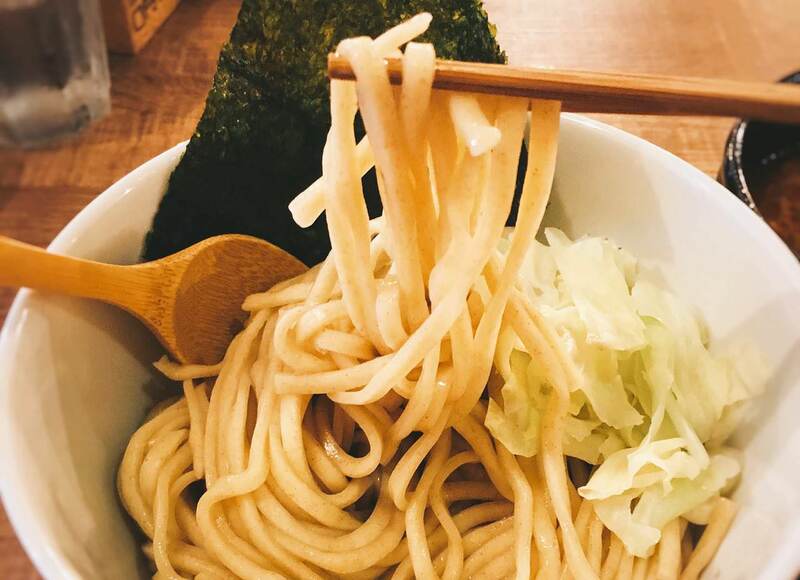 The thick straight noodle, which is a bit soft but chewy, has unique wheaty aroma. As the name mentioned, the sauce is thick and full of shrimp flavor since they stewed with shrimp essence (the head). 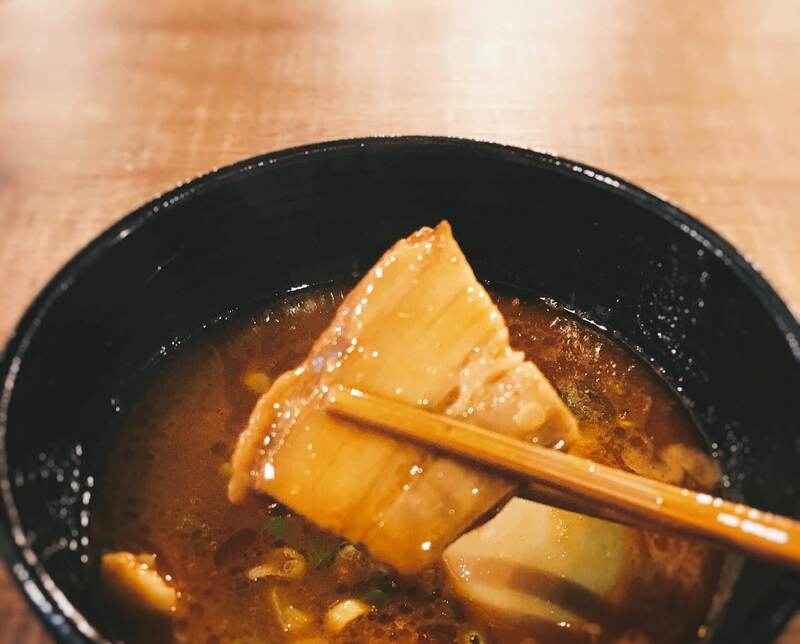 The collagen from pork and chicken broth thicken the sauce. 由於不常吃沾麵, 我只將麵浸到沾醬裡五秒鐘, 夾起麵時, 麵條意想不到地吸收了相當多的蝦味十足的醬汁, 吃起來可以說是相當過癮, 完全不用擔心麵都吃完, 沾醬還有剩, 清脆的高麗菜降低了膩感, 麵條的份量足夠, 依女生的食量一定會飽. 沾醬裡有著少許厚切軟嫩叉燒肉, 值得一提的是存在感極強的筍乾, 雖然不是拉麵必備, 但是三角型粗筍乾脆度口感跟麵屋武藏一樣棒. 店家將半熟蛋放入沾醬中, 搭配蝦沾醬會蓋住蛋黃膏本身迷人的風味. 基本上, 我會推薦這家餐廳給喜歡吃拉麵的人, 因為他們每週跟中山區的”勝王“不定期會推出不同湯頭. I dont usually eat dip sauce with ramen. So, I only dip the noodle into the sauce for 5 seconds. The noodle absorbs fair amount of shrimp flavor base sauce unexpectedly. Also, the dip sauce is far more than enough for pairing the large amount of noodle. The crisp cabbage decreases the dense flavor at the tastebuds.There are a few thick sliced tender porks. The thick sliced dried bamboo is also amazingly crisp just like MENYA MUSASHI Ramen. 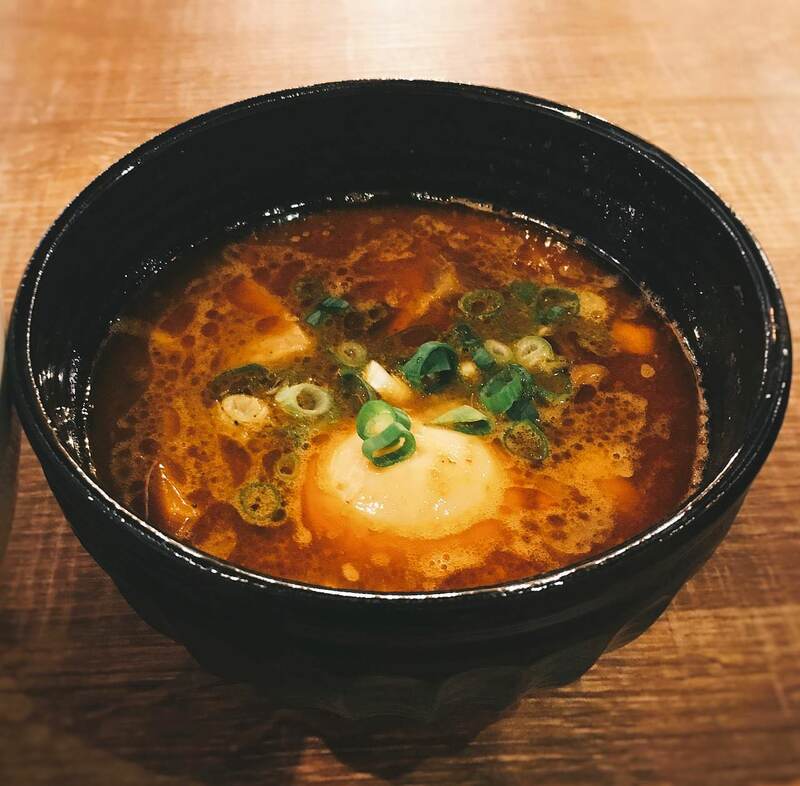 However, the half-boiled egg yolk is placed inside the sauce. 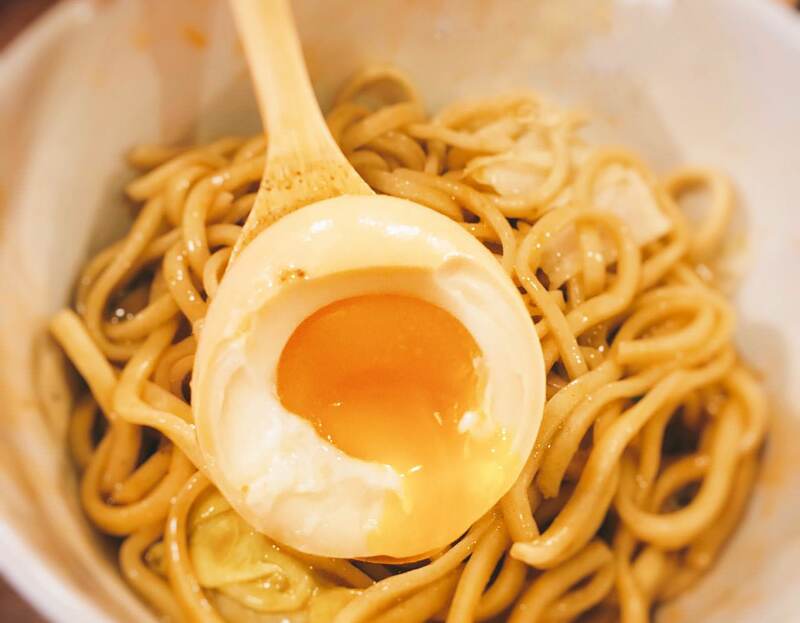 While tasting the egg yolk, the original flavor is obviously covered by the shrimp sauce. 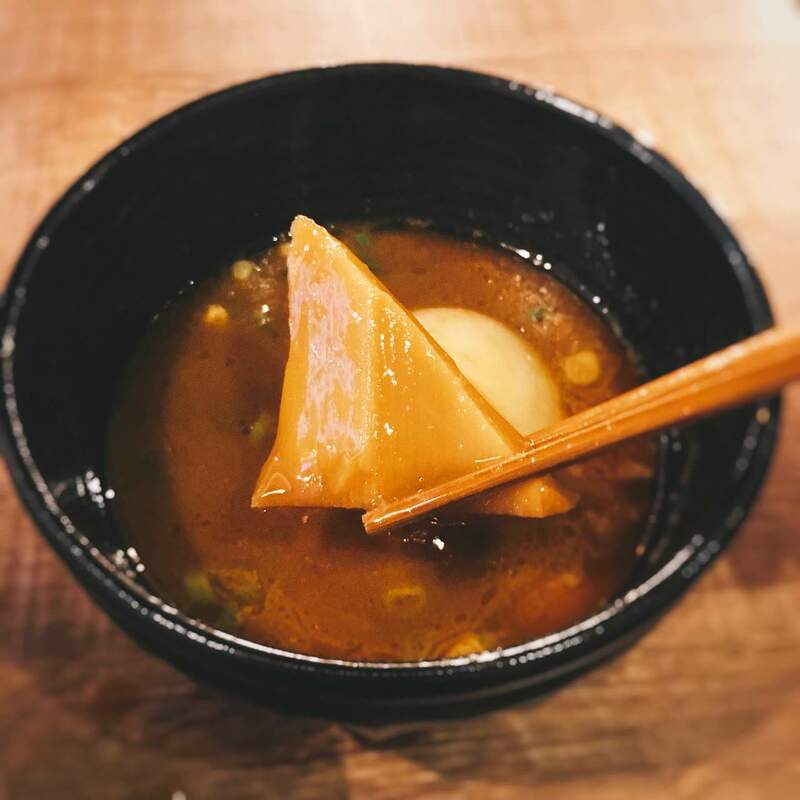 I would recommend this restaurant to Ramen Lovers since they promote different types of broth almost weekly.